To understand the importance of forage fish, imagine the Salish Sea without seabirds. Imagine it without salmon or orcas or seals and sea lions. You might also toss out its rockfish, cod or halibut. In fact, consider the ecosystem as you know it. Scientists have identified forage fish — small, schooling fish that provide much needed food (forage) for all of these species and more — as an indicator of the health of the open-water food web in the Salish Sea. These fish include commonly known species such as herring and anchovies, as well as less familiar ones like surf smelt and sand lance. All are considered critical, but until recently, many of them were not even on the map — literally. Key spawning grounds for several species of forage fish in Puget Sound are still being identified, and their habits in the marine waters of the Salish Sea remain largely unknown. These gaps prompted scientists to gather last spring for several sessions at the 2016 Salish Sea Ecosystem Conference in Vancouver. This article brings together some of the conference findings, and examines a central question puzzling researchers: Where do forage fish go, anyway? Many forage fish have one feature that gives us a small window into their secret lives: they return to shore to spawn. Pacific herring are the most heavily-studied forage fish in Puget Sound. This is partly due to their economic importance to the fishing industry, but also because of their spawning habits and the size of their eggs. Herring spawn from late winter through early summer in shallow habitats just off shore. They lay sticky eggs the size of dried quinoa or couscous grains on fronds of submerged algae, seagrass, and almost any other structure to which they can adhere. Their eggs are large enough that the biologists who manage herring can pull up the vegetation and visually estimate egg abundance. That provides some insight into how many herring are laying those eggs. Other species like surf smelt pose more of a challenge. They spawn year-round (although there are noticeable peaks in the summer in North Puget Sound and winter in South Puget Sound), and lay tiny eggs — about the size of FDR’s eye on the U.S. dime — in the gravel, rocks and sands of the intertidal zone. Sand lance spawn on beaches too, where their eggs become coated in fine sand, rendering them barely visible. After these tiny eggs incubate for several weeks, herring, smelt and sand lance larvae emerge and spend some time in the (relatively) safe, shallow waters close to shore. After this nursery period, they disappear into the depths. That’s when the mystery broadens. ...sand lance spend up to six months of the year completely buried under the sand. 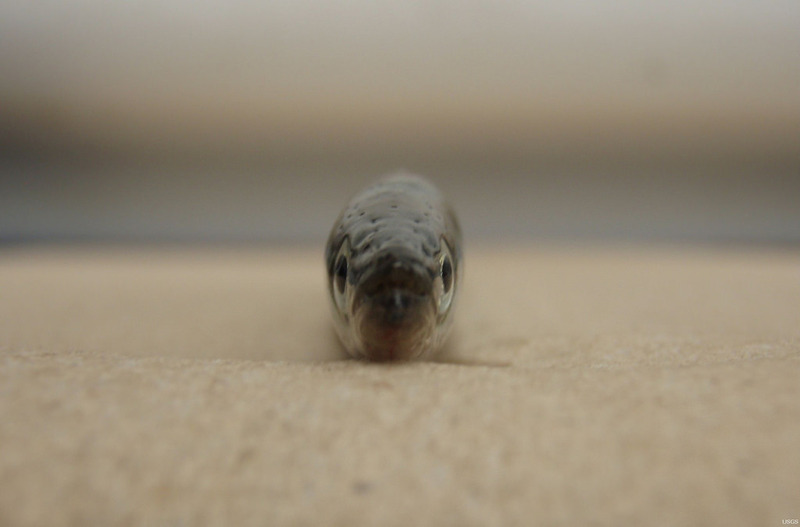 Sand lance are masters of avoiding detection. In addition to burying their miniscule eggs in the sand, they are skinny enough to slip through the mesh nets that are typically used to catch other forage species. Even with the right kind of net, the chances of finding them in open water are slim — sand lance spend up to six months of the year completely buried under the sand. If scientists are lucky, they can find them in shallow water on beaches, where they can be dug up with a shovel at low tide and counted. Often, however, they are under several meters of water. To find them in deeper water, scientists use a Van Veen grab — a heavy, awkward, crane-operated piece of machinery designed to sample sediments — to pull up a heavy block of sediment, and with it the wiggling bodies of sand lance. Matt Baker, Science Director at the North Pacific Research Board and affiliate faculty member at Friday Harbor Labs (FHL), has been working with students at FHL who have spent the last two years surveying sand lance in the San Juan Islands. They have been building a long-term survey dataset on sand lance diet, foraging patterns, and habitat preference. Gary Greene, a geologist who also works with FHL, has identified fields of sand ‘waves’ where sand lance are likely to be buried*. Baker’s team visits these fields to sample with the Van Veen grab. Baker and his students found that over the course of a single winter, the body condition of the fish they collect declines steadily, suggesting that they remain buried in the sand, dormant or nearly-dormant, through the whole winter. Research by Cliff Robinson at the University of Victoria using trawl data and oceanographic information has suggested that sand lance bury themselves in coarse sediments and emerge during the day to feed in well-mixed waters on the edges of sand banks. The picture that is emerging from these separate studies is that when they are not spawning, sand lance are either swimming in deep, offshore waters or burrowing snugly in the sand. Herring, on the other hand, appear to be a little more adventuresome. Doug Hay, a former research scientist for Canada’s Department of Fisheries and Oceans (DFO), may have some clues as to where herring go when they’re not spawning. He found herring accidentally while sampling for eulachon, another forage fish species. With the help of some anglers on the Fraser River, he observed herring swimming in a salt wedge — a deep layer of salty water that extends back up the river in highly-stratified estuaries. For a prey species, a river plume is “nice — the low visibility protects them from predators, and there are a lot of things to eat.” Hay found “dozens” of adult herring, their stomachs filled with baby pink salmon, lurking in the depths of the Fraser, much farther up river than most ecologists thought herring could go. The gonads of these herring indicated that they hadn’t spawned yet, and the only other population in the close vicinity that hadn’t yet spawned was the Cherry Point population. For this reason, Hay suspects that the fish they found in the salt wedge belong to the Cherry Point stock — a “stocklet” which has declined from ~10,000 tons in 1972 to an average of only 800 tons (approximately 6.4 million fish). This indicates that herring might be spending time rearing in places where ecologists — and predators — might not even look for them. If this is the case, managers need to conserve this secret refuge, and attempt to find others, in order to protect the plummeting Cherry Point stock. Another way to answer questions about behavior and habits in forage fish is to look for their larvae. 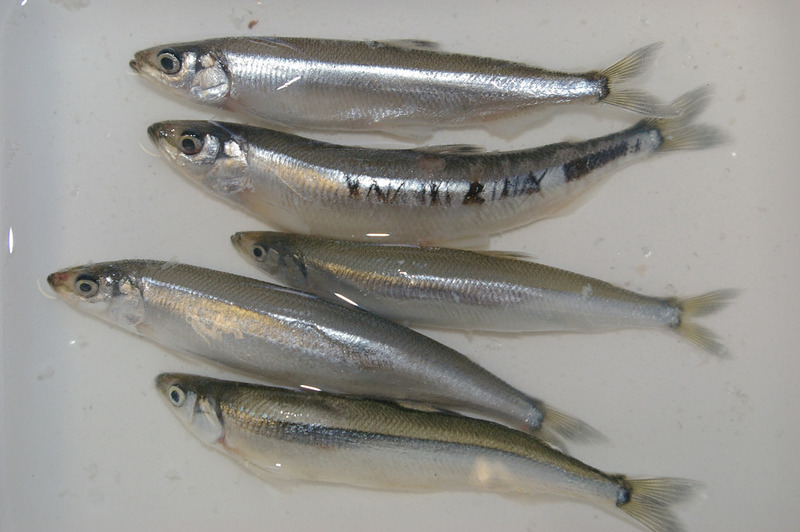 Forage fish larvae are sensitive; herring larvae use up their yolk sac in the first week of their life, and after that they depend on ocean currents to bring them to areas with microplankton and low predation in order to survive (Penttilla 2007). Almost nothing is known about the distribution of Puget Sound herring, sand lance, or surf smelt during this critical stage. Juvenile forage fish can be found in the water column for a few months after spawning. Alicia Godersky, a master’s student at the University of Washington’s School of Aquatic and Fishery Sciences, is studying the larval distribution of herring and sand lance in Puget Sound. Using information collected by scientists from The National Marine Fisheries Service (NMFS), the Washington tribes, and several research groups at the University of Washington, Godersky found that the presence or absence of larvae depended on the season and location of sampling. In some places (like Hood Canal) she found no sand lance at all. It turns out that larvae, like adults, are patchily distributed — but Godersky has a window into a part of the life cycle scientists know very little about. These larval surveys are essential for understanding the challenges that forage fish face during this crucial stage in their life cycle, when they are probably the most sensitive to oceanographic conditions. The surveys also provide additional information about where young forage fish go once they leave the beach where they hatched, says Godersky. Hints about forage fish movement might be found in archaeological records and genetic information. Robert Kopperl, an archaeologist with Steven W. Carothers & Associates (SWCA) Environmental Consultants, studies Native American middens — large piles of ancient food waste discarded by some of Washington’s first residents. At Burton Acres Park on Vashon Island in Central Puget Sound, he found a shell midden with thousands of herring bones underneath, from up to 1000 years ago. “The prootic bone is my favorite — it is dense compared to the rest of the skull so it sticks around when the central orb erodes,” he enthuses, “there are two per individual so it’s a convenient way to count how many herring there were.” He found between 4,000 and 6,000 herring in the Burton Acres midden, and he anticipates finding more at other sites in south Puget Sound. The herring bones will be sent to Dr. Dongya Yang’s lab at Simon Fraser University for extraction of ancient DNA. Using bones from different sites in South Puget Sound and comparing with genetic data from today’s herring, Kopperl and Yang should be able to figure out whether certain genetic groups (like Cherry Point) were always present, or whether they are relatively new to the Sound. Uncertainty about the ecology and life history of forage fish could make it difficult for managers to adequately protect them. Daniel Okamoto, a postdoctoral researcher at Simon Fraser University, has developed a model that shows that herring populations in BC may seem more stable than they really are when they’re surveyed on a broad scale, causing managers to allow fishing pressure that puts local subpopulations at risk of overfishing. This finding is corroborated by Ashleen Benson (Adjunct Professor at Simon Fraser University) and Jaclyn Cleary (Biologist at DFO), whose model explores the effects of fishing on herring subpopulations with different rates of movement between them. Benson and her coauthors found that mischaracterizing the amount of movement can put local subpopulations or regional populations at risk of depletion. This shows that herring movement is something managers have to consider in order to sustain fisheries for herring and the predators that depend on them. There are also places in Washington where knowing about herring movement might help managers protect them. Doug Hay jokes, “As we all know, herring don’t swim past the 49th parallel.” Cherry Point herring are surveyed and managed by WDFW, but the adults can easily swim north past the border into Canadian waters, where the herring fishery is managed by DFO. If the WDFW scientists knew where Cherry Point herring spent their time, they might collaborate with managers in Canada to protect adults that are crossing over. 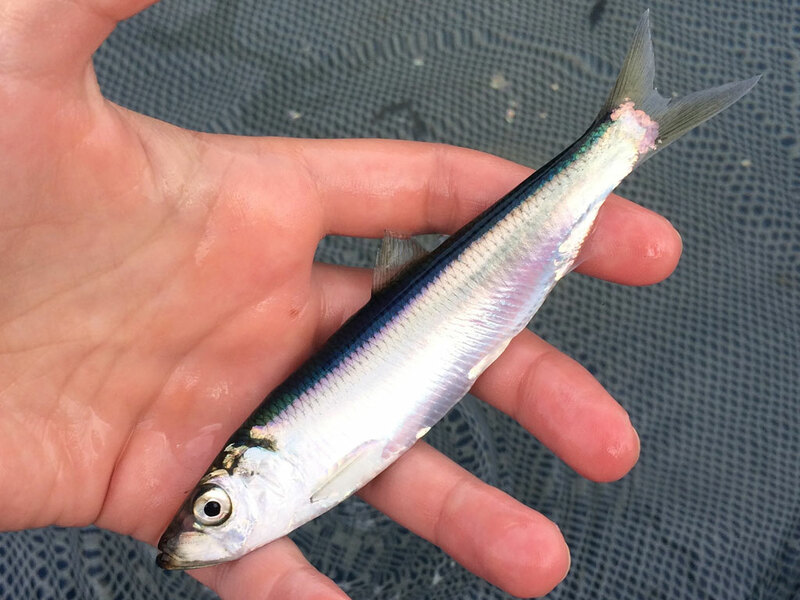 Knowing about trends in other forage fish like surf smelt and sand lance will help WDFW determine which spawning beaches are more important, or whether the recreational fishery for surf smelt needs to be more carefully regulated. The solution of these mysteries could improve management and mitigate risk. The talks at this year’s Salish Sea Ecosystem Conference highlighted some critical gaps in our understanding of forage fish ecology in the region. Although scientists have some idea of the population status of herring and have likely located all of the possible spawning beaches — largely because the commercial fisheries targeting herring make them a valuable commodity — sand lance and surf smelt remain largely uncounted and difficult to locate, and surveys will be misleading if they miss crucial life stages or subpopulations. Says Liedtke, “knowing where they spend time is a first step towards defining and ultimately protecting their critical habitats.” Larval surveys may be the one way to accurately estimate their numbers. For other forage species, information about trends in abundance could be a life-saver when it comes to managing them. These recent discoveries, and the mysteries that remain to be solved, show that basic biological knowledge about forage species can help us manage shorelines and protect the people and ecosystems that rely on these fish. Kopperl, Robert E., 2001, Herring Use in Southern Puget Sound: Analysis of Fish Remains at 45-KI-437. Northwest Anthropological Research Notes 35(1):1-20. Penttila, D. 2007. Marine Forage Fishes in Puget Sound. Puget Sound Nearshore Partnership Report No. 2007-03. Published by Seattle District, U.W. Army Corps of Engineers, Seattle, Washington. Stick K, Lindquist A, Lowry D (2014) 2012 Washington State herring stock status report. Washington Department of Fish and Wildlife Technical Reports. Report Number FPA 14-09. July 2014. 100 pp. * According to previous research by Clifford Robinson, sand lance bury themselves at sites with unique oceanographic and sedimentary properties, and forage in the water column nearby. Margaret Siple is a Ph.D. candidate at the School of Aquatic and Fishery Sciences at the University of Washington where she studies the ecology of forage fish. She is interested in the biological mechanisms that affect stability in forage fish populations (population diversity, disease, and predation), and how we can incorporate these processes into predictive models for management. Much of her research has developed through collaborations with scientists at the Puget Sound Institute, USGS, and the NOAA NWFSC, and is funded by NSF and the ARCS Foundation.